Current Special! Complete Excel Excel Training Course for Excel 97 - Excel 2003, only $145.00. $59.95 Instant Buy/Download, 30 Day Money Back Guarantee & Free Excel Help for LIFE! 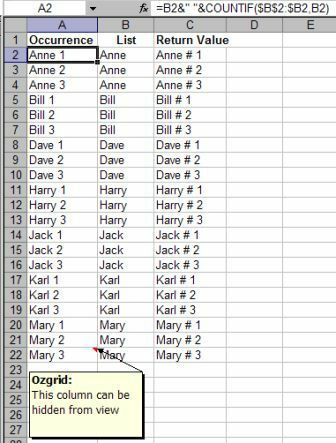 As you may already know, we can use VLOOKUP , or INDEX/MATCH to locate the first occurrence of a specified value in a list, or table of data. However, Excel has no ready made formula that allows us to locate say the second, or third occurrence etc of a specified value. To do this would normally the use of a Custom Excel VBA Function, or a horribly inefficient A rray formula . Below you will find 2 ways to locate the nth occurrence of a specified value and return the value on the same row but in another column. One is straight forward and requires no VBA, while the second does make use of Excel VBA. Neither need array formulas! Find the Nth Occurrence of Specified Value Non VBA Method. I will use the table of data as shown below for the example, sorted only for easier reading. Note the formula that resides in the selected cell A2 (see Formula bar) is: =B2&" "&COUNTIF($B$2:$B2,B2) and is used to obtain a count of each occurrence. It is vital to note the Absolute of $B$2 and the relative row reference of $B2. This is vital so when you copy the formula down, it will extend the COUNTIF range accordingly. Would yield a return value of "Bill # 3"
The custom function/formula below was written in Excel 2003 and may not work in earlier Excel versions. Where $B$1:$B$22 (range_look) is the range to find the 3rd occurrence (occurrence) of "Harry" (find_it). When found, it will return the value by offsetting 0 rows (offset_row) and 1 column (offset_col) to the right. The offset_row and offset_col arguments can be negative values if that is what is needed.